Editor/Author Cronin, Ciaran, Cronin, Richard and Harrison, Antony, et.al. This Companion brings together specially commissioned essays by distinguished international scholars that reflect both the diversity of Victorian poetry and the variety of critical approaches that illuminate it. 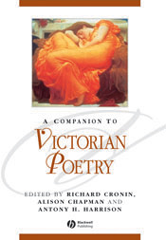 Approaches Victorian poetry by way of genre, production and cultural context, rather than through individual poets or poems. Demonstrates how a particular poet or poem emerges from a number of overlapping cultural contexts. Explores the relationships between work by different poets. Recalls attention to a considerable body of poetry that has fallen into neglect. Essays are informed by recent developments in textual and cultural theory.